Spider Rock is located along the South Rim Drive in the Canyon de Chelly National Monument near Chinle, Arizona, A short trail leads to a vantage point that overlooks Canyon de Chelly (de-shay) and the monolith the Navajo people call Tsé Ná ashjéé' ii -Spider Rock, the home of Spider Woman. Spider Woman is a deity who in Navajo mythology was the one that taught the People (Diné [dee-nay]) how to weave. For the enormously rich and poetically expressive Navajo religion the anthropomorphic deity of Spider Woman is among one of the most important. Spider Rock Overlook is the last of the seven stops along the South Rim Drive. 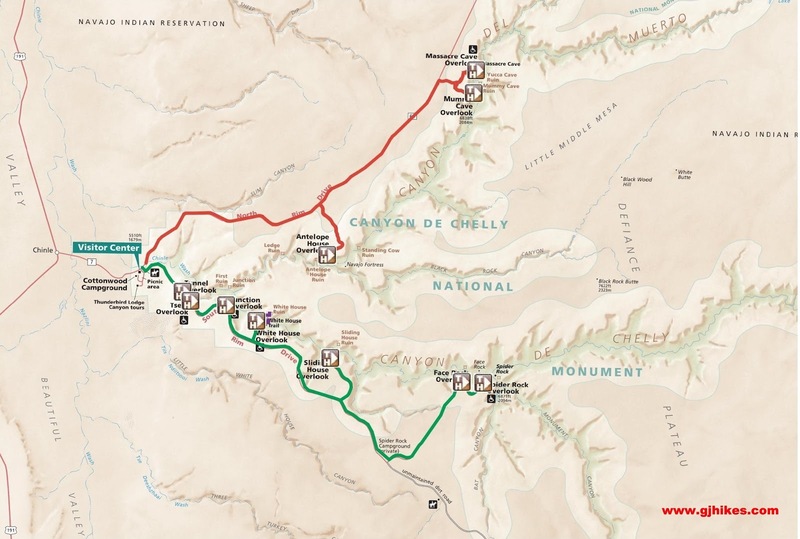 The trailhead is about 15.5 miles east of the junction of the North and South Rim roads. There are a couple of spotting tubes at the beginning of the trail that make it easier to locate ruins that are across the canyon. The trail itself is a wide concrete path that is wheelchair accessible. Scenic sandstone outcrops bordered by various types of brush and junipers add to the tranquil setting as the trail works its way around the point of the cliff to the viewpoint. Even to this day the hustle and bustle of the modern world is held at bay from encroaching too near to drown out the peaceful sounds of nature and of ones own thoughts. The iconic spire of Spider Rock stands in full view from each of the overlooks. Whether there is a certain time of the day that is better for taking photographs we can't say. We have seen numerous photos taken at various times and under different weather conditions and they all look fine in their own way. There is an additional short section of trail that isn't wheelchair accessible. From here some of the ruins across the canyon can be spied a little easier. Each of the little alcoves near the canyons rim seem to have a structure of one sort or another within them. The interesting thing about this picture is the tree leaning up against the cliff in the second alcove from the right. The tree would have been used to climb up and down to get access to the alcoves. Every so often in our travels we come to a granary or cliff dwelling that looks impossible to access without the use of modern climbing gear and this is reminiscent of that type of place. For a better appreciation of Spider Rock, as well as all the other sites at Canyon de Chelly, one can begin at the Visitor Center, look at the exhibits and read any brochures that are available. Reading a book about the Navajo history and customs or searching among the many sites on the internet would also be good preparation before visiting. To view the natural wonders that abound in Canyon de Chelly like Spider Rock will satisfy some interests but to understand better why the Navajo call this a sacred place will help you to have a much more fulfilling visit. If you would like to see it for yourself then all you have to do is 'Take a hike'.